We love ordering braised beef brisket on rice or soup noodles from Cantonese (Chinese) restaurants and cafes. One of the variations that we like is the curried one. The best parts are the connective tissue and the tendons that get broken down and become soft and chewy. 🙂 (See the plain, braised beef brisket and tendons recipe here.) 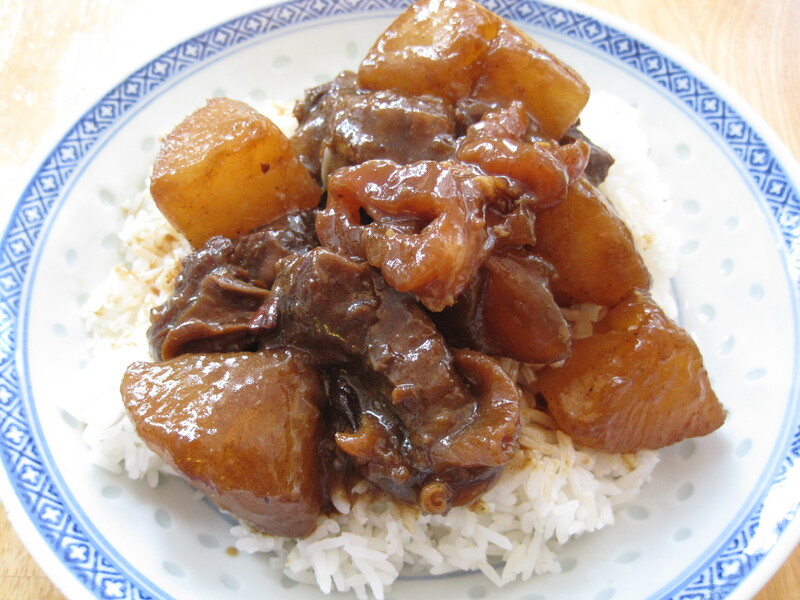 If you have leftover daikon radish, see here for a list of other recipes. Place the whole beef tendons in a medium sized pot of water and bring to a rolling boil over high heat. Then allow it to continue boiling for 10 to 15 minutes. This is a cleansing process so you will see scum and foam rise to the surface. Rinse the tendons well under cool water and chop crosswise into 3/4 inch thick pieces. Set aside. Heat a medium sized, heavy bottomed pot (I use an enamel coated cast iron pot) over medium high heat. Lightly coat the bottom with vegetable oil and brown the sides of the beef. You will need to do this in batches. Do not overcrowd the pot. Set the browned pieces aside. Turn the heat down to medium if the pot starts to burn and add more oil as necessary. When all of your pieces of beef have been browned, put them all back into the pot and add the ginger and garlic. Stir until fragrant, about 10 seconds, and deglaze with a large splash of shaoxing wine. Scrape up the bottom bits and allow the shaoxing wine to reduce for a minute or two. Meanwhile, in a small bowl, mix together the curry powder, turmeric (if using), and sesame oil. Add the chee hou sauce to the beef and stir well to combine. Then add the tendons, 2 cups of water, the curry and sesame oil slurry, and the soy sauce, rock sugar, star anise, cinnamon, and white pepper. Most of the meat will be submersed in water. Cover with a lid and bring to a boil. Then reduce the heat to maintain a simmer, covered, for 1 hour. Stir occasionally and ensure that the tendons are completely submersed in the liquid. The rate at which your liquid evaporates will depend on the weight of your lid and the seal between your lid and pot. If your water is evaporating too quickly, add more water as necessary. If your liquid is not evaporating, simmer partially covered. It’s a Chinese sauce that is mostly used for braising, but can also be used in stir fry. Here’s the list of ingredients: sugar, vinegar, soya bean, water, salt, wheat flour, garlic, sesame seed, chili, spices & artificial color. It’s a thick, dark coloured paste-like sauce. Similar to hoisin sauce, but thicker and darker. I’m sorry about that. I’m not sure what happened… I only use firefox. I hope that it will work for you on a later date. Thank you for letting me know about the issue. Wow! This dish was absolutely delicous! It tasted just like the restaurant I normally order this dish from. Hi Kim! I’m SO glad you liked it!!! Yes, definitely add as much soy sauce as you like! My family has been on a low-sodium diet for years so it’s no surprise that you wanted to use more 🙂 I use Kikkoman too 🙂 Thank you for posting a comment!